As Unitarian Universalists, we welcome all persons as members regardless of race, age, disability, sexual orientation, economic status or faith. We respect diverse sources of religious inspiration, and endeavor to teach our children and ourselves to live with reverence for life and in harmony with all creation. A vision of community guides everything we do at People’s Church. Membership is open to anyone 16 years of age or older who is in sympathy with our church’s vision and mission, as well as with the principles and purposes of the Unitarian Universalist Association. Membership is a form of belonging to and taking root in our particular community. It is expected that members actively support the operations of the church through regular attendance, service, and an annual financial contribution of record. Meet and Greet at Second Sunday Lunch: On a regular basis, meet and greet sessions are held at the monthly Second Sunday Lunch. These events are a great forum to ask questions and get to know People’s people better. Check the Events Calendar for the next Second Sunday Lunch date. Newcomers and visitors are first in line for lunch and eat free! Come join us! Connections Dinner: Twice a year, a Connections Dinner is sponsored by the Membership Committee. This is an informal chance to get to know other People’s people, our staff and other lay leaders. Check the Events Calendar for the next Connections Dinner date. Path to Membership Workshop: We encourage everyone interested in learning more about People’s Church, Unitarian Universalism and How to Join People’s to attend our Path to Membership Workshop. This class allows participants to get to know other people who are exploring membership. Presented jointly by the Membership Committee and the minister, topics include the history of Unitarian Universalism and People’s Church, our work in the wider community, and the rights and responsibilities of membership – as well as time to explore our spiritual journeys together. Check the Events Calendar for the next Path to Membership date. 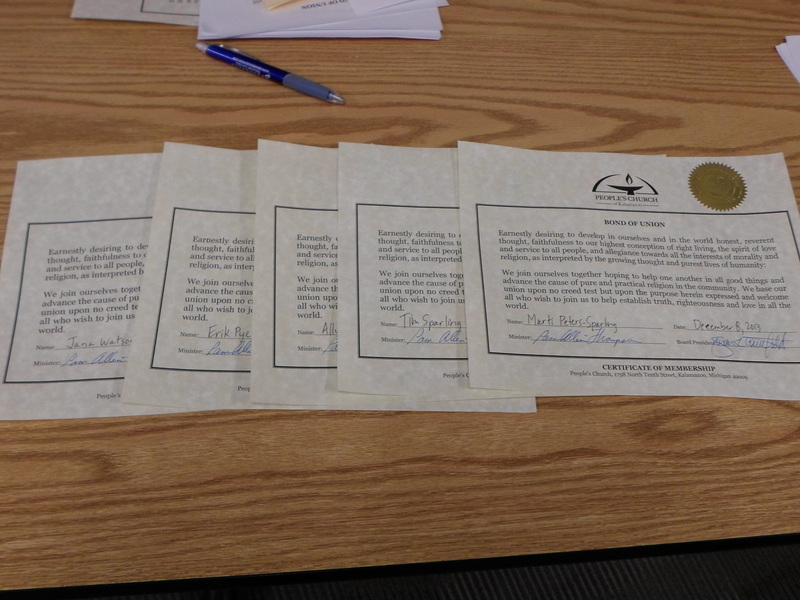 Membership Recognition Sunday: On this designated Sunday, we welcome new members into our congregation. A Bond of Union signing ceremony is held in Room 19 prior to the Sunday Service. During the Service, new members are briefly introduced to the congregation and then welcomed through song. Check our Events Calendar for the Member Recognition Sunday. Please let Pat Nelson or Chris Schleuder know if you are interested in joining. The Bond of Union can be signed at any time! When you are ready to join, we invite you to contact Pat Nelson of our Membership Committee. You may find answers to any questions you may have by talking with our minister, Rev. Rachel Lonberg, our office administrator, Chris Schleuder, or a member of the membership committee at the Information Desk in the downstairs lobby or at the desk at the top of the stairs on Sundays.